Problems on trains aptitude questions asked in many competitive exams and Problems on trains are also important for SSC and Banking exams. Here you can learn Problems on trains aptitude questions. Prepare for competitive exam by practice Problems on trains questions and answers. You can also learn that how to use problems on trains formulas in different equations by one click and also can practice Train problems aptitude with answers for a better score in the competitive exams. 3. In what time will a train 100 metres long cross an electric pole, if its speed be 144 km/hr ? 5. How long does a train 110 metres long running at the speed of 72 km/hr take to cross a bridge 132 metres in length? 6. A train 360 m long is running at a speed of 45 km/hr. In what time will it pass a bridge 140 m long? 7. A train traveling at a speed of 75 mph enters a tunnel 3 miles long. The train is mile long. How long does it take for the train to pass through the tunnel from the moment the front enters to the moment the rear emerges? 8. A train running at the speed of 60 km/hr crosses a pole in 9 seconds. What is the length of the train? 9. A train 132 m long passes a telegraph pole in 6 seconds. Find the speed of the train. 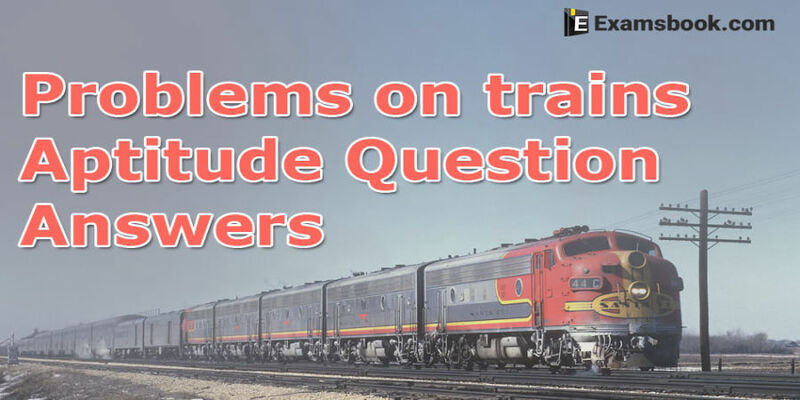 If you face any problems in solving problems on trains questions, ask me in the comment section. Click next for more questions.